Last year I participated in this meme featuring 10 of my favorite photos. 10. Yakionigiri soup. This was a dish I recreated after our trip to Hokkaido in February...a great way to warm up on a chilly morning! 9. Nikumaki Onigiri. This dish was inspired from a photo I saw in a magazine. It was a little labor intensive, but I loved the flavors. 8. Milk Jam. This was my first time making my own milk jam or dulce de leche. I enjoyed this and am definitely make this again. 7. Tarte Tatin. This was my first time making and eating this. It was a delicious upside down apple pie and also good with vanilla ice cream. 6. Vegetable Hash. Sometimes good food comes from experimenting. I had envisioned crispy hash, but the results were a little moist, still it was great with an egg on top. 5. Walnut Shrimp. The first time I tried this recipe it was REALLY labor intensive. I revised it and came up with an easier version. 4. Veggie Curry. This was a colorful way to plate curry. Even though I used pre-made roux to make the curry itself, I loved the bright colors on my plate. 3. Greek Nachos. You will never go back to "real fake" cheese after eating this. 2. Ahi Poke Slider. This was a nice way to have poke. I think you could serve this any time of the year. 1. Ayun's Salad. This salad was so simple and the flavors intense. I'm making this again next summer. Overall, 2009 was a great year. Sure, we had some bumps along the way, but for the most part, it was good. While my kitchen experiences weren't as frequent as I would have liked, I think the ones that I did have were mostly good experiences. Thank you readers, I look forward to your comments and emails, they really brighten my day. Though the economy isn't too good, I am happy that we get to gather around each other's dining room tables virtually, sharing ideas and experiences. 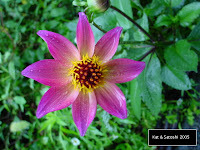 I hope 2010 will be a good year for everyone--healthy & prosperous. Just wanted to share with you a list of the books I've read this year. Mostly food related. Not as many books as I would have liked to finish this year, but still an improvement from years before. 1. Anthony Bourdain, "The Nasty Bits"
2. Laura Esquivel, "Like Water for Chocolate"
4. Ayun Halliday, "Dirty Sugar Cookies"
5. Kent Haruf, "Where You Once Belonged"
7. Sophie Kinsella, "Shopaholic & Sister"
8. Peter Mayle, "Toujours Provence"
9. Haruki Murakami, "After the Quake"
10. Ruth L. Ozeki, "All Over Creation"
11. Sudi Pigott, "How to be a better Foodie"
12. Michael Pollan, "In Defense of Food"
13. Julie Shigekuni, "A Bridge Between Us"
14. Kim Sunee, "Trail of Crumbs"
15. Kimberly Witherspoon, "Don't Try this at Home"
I recently found out that Wendy's is leaving Japan at the end of the year. Amazingly, we have 3 shops in our area and I have only been here once. This fast food place was one of the first places Satoshi and I ate at when we first moved to Minoo. So the other week, in honor of their departure, we checked them out for our last time. I had their bbq bacon burger...for me, I love anything with western barbeque sauce on it because it is so rare around these parts. And look at the bacon s-t-r-e-t-c-h-i-n-g out of that burger! Though they could have made it a tad bit crispier. We shared their chili cheese fries. I am glad I didn't run into this earlier, I may have become a regular customer because this combo surely soothes the goopy cheese and spicy chili cravings. Apparently Burger King came to Japan, left and came back...who knows, maybe Wendy's will too. Until then "sai-nara" (good-bye in Kansai dialect)! Saturday, Satoshi had to work, so I met him in Umeda for a late dinner. We started with some Hanoi beers 682 yen (about US$6.82) each. This beer was easy to drink, not watery and had good flavor to it. We ordered the clay pot spare ribs with egg--924 yen (about US$9.24). This was a good choice. We loved the sweet yet salty flavor, though I wished they cooked it a bit longer so it would have fallen off the bone. This dish reminded me of chinese style roast pork but with a hit of chili. The table next to us, was checking out what everyone ordered and wanted to order this spare rib dish but was denied because they had sold out for the night...lucky we were there before them. The seafood stuffed spring rolls with mint chili sauce was delicious. 924 yen (about US$9.24), we loved that the rolls were filled all the way and you weren't only eating the fried casings. Spicy squid salad with cellophane noodles 997 yen (about US$9.97) was light and refreshing with huge pieces of squid. The chicken fried noodle was a bit of a disappointment for me as I envisioned something a little more drier...945 yen (about US$9.45). This had bamboo shoots, onion, some chicken and other veggies. This dish sort of reminded me of something I've had in chinese restaurants in Hawaii. Another reason this dish was a disappointment for me was that we had to wait a really long time before it came out. Overall cost 5154 yen (about US$51.54), not bad portion wise, and the food was tasty with just enough spice. We'll be back. The other week I re-visited Condi. You may or may not remember that they make great soft pretzels. On my re-visit, I picked up a Laugenstangerl, and this fig walnut bread. At 360 yen (about US$3.60), it was a small loaf, kinda pricey. I was worried that the figs inside would be sparse, like most breads are. But upon cutting it for breakfast...the whole bread was filled with whole figs and walnuts! In some areas, more fig than bread. We loved this as is, no need for butter or jam. I think I have found another favorite at this bakery. What did you eat for Christmas dinner? Since I was meeting my friend for coffee (which actually turned out to meeting for lunch), I went to the market in the morning to look for something for dinner. The "western" type foods were expensive (chicken still super expensive), but sushi was cheap! 9 pieces for 580 yen (about US$5.80). And if you bought the 18 piece pack it was only 1080 yen (about US$10.80). And I made some fragrant chickpea salad, because I found this bambucha (huge) New Zealand red bell pepper for 198 yen (about US$1.98). Total cost for our Christmas dinner...1476 yen (about US$14.76), not bad, don't you think? What did you enjoy for your Christmas dinner? Yesterday, I met up with some of my beading friends and we had lunch in Umeda. By the time we finished, it was mid-afternoon, definitely too late to gather ingredients to cook, so, I decided to buy something for our dinner. There was quite a crowd trying to buy different foods also and man, the price for food on Christmas eve was pricey! Since Satoshi probably wouldn't come home early, I decided to buy salads instead of chicken or something fried. After buying dinner, I went upstairs to the sweets floor. This is what I bought for Satoshi...chocolat mont blanc. He said this was delicious, chocolate and marron (chestnut). And this was the cake that I got for myself..mini bouche noel (mini yule log). For the size, this tiny cake had a LOT of cute decorations on it. Total cost of our dinner...2904 yen (about US$29.04). Oh and Santa actually came by early to bring me the iPhone3GS last week...one of first things I downloaded was Kalapana's "For You I'd Chase a Rainbow". I hope Santa brought all you wished for. I'm meeting my friend for coffee today, it will be interesting to see what I can find for our dinner tonight. A close-up of the cute decorations... UPDATE: Hamburg is no longer in Daimaru Umeda. (Photo taken in Kiddyland, near their Miffy store, the sign said "no touch" but didn't say I couldn't photograph it)...a Miffy macaron tower. Today is Christmas Eve. In Japan, a special day to spend with your special someone. I've written about the eve here and here, check it out if you wish. Yesterday was a holiday and we got together with my host-family. It was a very lively get together as their children's children are getting bigger. There was lots of home cooked food by my host-mom and lots of conversation. It is at this time of year that I particularly miss our family gathering on Christmas Eve in Hawaii. Many families in the neighborhood getting together, bringing a dish or two. Catching up with each other. When we were little, the fathers of the neighborhood would take turns being Santa. And as we got older, we did family gingerbread houses. Can you imagine, us putting "snow" (royal icing) on everything? We'd never even seen snow before (we were in Hawaii). Fun times all around. For the past 3 days, my kitchen was "closed", in addition to our gathering with my host-family, Satoshi had his bonenkai get togethers . I think I may end up buying dinner for us over the next couple of days. I know, sad, but since Satoshi is working, he probably won't be home in time to eat dinner with me. So, from our house to yours, we hope you have a very Merry Christmas! Li hing powder added to sour watermelon and sour green apple candies...I like these, but like the addition to sour patch kids better. A reader recommended this Lipton Apple Tea...at 100 yen (about US$1) a container, it is a good deal, but it is too sweet for my liking. Thanks for the tip though. I'd like to share with you the cute Christmas-y packaging. KFC's grilled chicken sandwich. This has a Korean taste to it. I like the spiciness of it. Lawson's shake (sha-kay) harami musubi. Harami is the belly. Salmon belly (a big chunk of it wrapped in the middle of this musubi. Delicious! Remember the baum kuchen Satoshi received for attending a wedding? This is it. A moist cake coated with condensed milk on the outside...mmm! Muji's chocolate covered marron baum kuchen...really moist and delicious! I bought this at Family Mart (a convenience store). The cake is marron (chestnut) and is coated with a dark chocolate. Food Should Taste Good's sweet potato tortilla chips...yum! I had this on my last trip home. I want to try the other flavors. Pannetone from DonQ. This buttery bread is filled with raisins and candied citrus pieces. Kinda pricey though for just a slice. Del Sole's mixed pizza. This is a great pizza I've found in the supermarket. The crust gets really crispy. And I love how they use pesto instead of tomato sauce. I have also tried their crispy crust and put my own topping on them and am looking forward to trying their Napoli style crust. Stollen from Abientot. My only problem with this was the granulated sugar used to coat the outside....while this place is one of my favorites, meh, I don't think I would buy their stollen again. Michel Chaudun's pudding...rich, chocolatey with a hint of liquer...a delicious dessert. Homemade bark using 60%, 72% chocolates, pistachios, some fleur de sel, almonds & cranberries...yum! Mariage Frères' Earl Grey French Blue Tea...received from my blog friend PT Ford...delicious! I love the flecks of blue cornflowers (I think they are cornflowers) in there! Fresh's mangosteen bar...talk about refreshing! I always pick up a couple of soaps while I am home, this was one of them. If you use them, how big is your deodorant? You know how during the summer I grumble about the humidity here? Well, I think I may have also grumbled about how there are some people who smell on the trains. Anyway...I usually stock up on deodorant for Satoshi and me whenever I go back to Hawaii, because it is cheaper and you get more for your money. Though with the airline weight restrictions, I've been trying to "wean us" off, trying to find something here so that I won't have to take up space in my luggage. But with what I've found here so far, it is a rip-off, 700 to 900 yen (about US$7-9) for a teeny container of the stuff (see the teeny pink container in the first photo??). Plus, when you reach the end, there is so much wasted because you can't get at the area in the swivel of the deodorant. I haven't had my eyes checked...well, since we left Hawaii in 2001. When I got my eyes checked in Hawaii, my doctor would put a gadget up to my eye and look into it, and he was so close that I was looking into his eye...I used to end up laughing a lot during those check-ups. A couple of months ago, I finally got my eyes examined here and was amazed at how the process has changed. You choose the glasses which range from 3000 yen (about US$30) to 9000 yen (about US$90). They then take you to look into a machine (I think a refractor) and it tells you your eyesight within seconds. After it determines your eyesight, you move to another machine and they tweak the lenses. If they have the lenses that match your glasses in stock, you can receive your glasses within an hour. The best part of this is that the glasses you choose usually is the total price for your glasses. So, if you pick a pair that is 3000 yen, then usually that would be all you pay. Only if you want "special options" like sun protection or thinner lenses, then the price would be a bit higher. I need these for "close-up"...hopefully I can get back into beading now. Yesterday, Satoshi had his German language class in the afternoon. After his class, he planned to meet his classmate for dinner. So, we had lunch together before his class at Ou-Lou, a Cantonese restaurant in the Hanshin Department Store. We've eaten here several times, and their food is always good. I wanted noodles and their char siu bao. Satoshi wanted some fried rice. As we looked over the menu, we also looked over at the next table. And ended up ordering this...a crispy noodle topped with mabo eggplant (what the table next to us had). I really love crispy noodle (in Hawaii we call it cake noodle). In some places of Japan, it is called "sara udon" (literally plate noodle). I'm really glad we ordered it, it was spicy and crunchy...1050 yen (about US$10.50). These steamed char siu bao, are called char siu manju in Japan...I love how "fluffy" the outsides are, and how sweet the char siu is inside....525 yen (about US$5.25) for two. Very different from the nikuman (meat buns) that you find at the convenience stores. The fried rice was tasty, with lots of plump shrimp and bits of sweet char siu...945 yen (about US$9.45). We apparently had our lunch at the perfect time, as we left, the line for a table was out the door. It's bonenkai season here. Satoshi has been eating out several times during the week. Which is fine with me, because I don't have to cook and usually buy something to eat. But, for the dinners that he does have at home, I've been trying to get our veggies in with our main dishes, so that we won't have to eat cold salads. I tried a new recipe the other day and adapted it because I had veggies in my refridge that needed using. The recipe is kinda rough around the edges because I noted what I used. adapted from "Orange Page's Fuyu ni Oishii Kondate"
I served this dish with kim chee miso soup, nukazuke (pickles soaked in rice bran) and rice. For another dinner, I threw together a dish which was "nikujaga" mixed with cleaning out more veggies in the fridge. I used this recipe. For the meat, I used leftover thinly sliced pork. I added 2 carrots, 1 sweet potato unpeeled, part of a daikon(long white radish), 1 onion and 1/4 cabbage. I followed the recipe for the sauce and method to make it. It came out delicious. And for another dinner, this was a last minute "I don't really feel like cooking anything" dish. Satoshi called me at the last minute one day to say he didn't need dinner (he had a last minute drinking gathering with a sales office). I had some leftovers in the refridge, but didn't feel like eating it. So I sauteed some zucchini and eringi in EVOO and seasoned it with Herbs de Provence. Then added an egg and put everything over rice. A couple squirts of ketchup and hits of Tabasco. A simple yet satisfying dinner in less than 15 minutes! What have you been enjoying for dinner? Wednesday, Satoshi had the day off, but I had an early evening lesson. 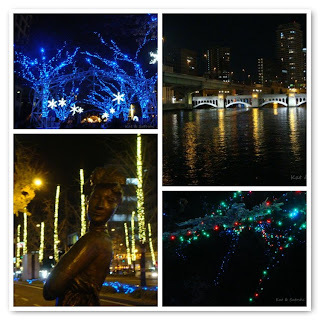 Still, it was the perfect chance to check out the Midosuji Illuminations in Osaka. After my lesson, we met down the street at the Hard Rock Cafe for dinner. It had been awhile since we had eaten here, but talk about expensive! I had my first mojito 800 yen (about US$8), this drink was really refreshing, loved the lime. We ordered the small nachos with guacamole 1450 yen (about US$14.50). This is Satoshi's favorite, whenever we eat at American fast food places especially like HRC, this is what he orders. We also got their jumbo combo, a plate full of appetizers 3360 yen (about US$33.60). Potato skins, buffalo wings, honey mustard chicken fingers, onion rings & taquitos. 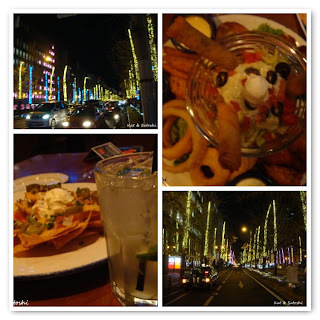 From the Hard Rock Cafe, we walked straight up Midosuji (a main thoroughfare) towards Umeda, taking in lots of lights. I think this was the first year for this event. Since this is the business district, I think they appreciated the foot traffic. Some gingko biloba trees still had their leaves which made them seem brighter with the illuminations. It was a great way to walk off all that junk food and a great way to get into the Christmas spirit. Sometimes Japanese etiquette can be wishy-washy...sometimes I think that my MIL is. When my FIL passed away last year, we sent out mochu hagaki to our friends in Japan. But that year, we also received mochu hagaki from my MIL and BIL. We thought it was kinda weird to receive it from them, I mean, we are immediate family, right? So, this year, when Satoshi's grandma passed, we sent out mochu hagaki to our friends in Japan and we also sent the cards to our immediate family because that was what my MIL and BIL did last year. Well, this year, my MIL and BIL decided not to send out mochu hagaki to our immediate family and since we sent out mochu hagaki, we made my MIL and BIL look bad because the immediate family received cards from us and not them. Satoshi, on the other hand, said trying to "cover it up" the death of his grandma with the celebratory cards, would offend his grandma and offend the rest of the immediate family. And, in actuality, we would be "living a lie". I dunno, I know families have their secrets, and I like my MIL, but I guess maybe we should get "clearance" before we do stuff from now on...sigh. After posting my s'mores photos, my Flickr friend, Ebi Debi, suggested that I add a peanut butter cup to my s'mores. Since I didn't have any in the house, I added a dollop of crunchy peanut butter instead. Thanks for the suggestion Ebi Debi! Satoshi had to work on Sunday, so I met him in Umeda for dinner. We met at the Maru Building and had planned to eat at a dining bar, but changed our minds when we saw the photos for Alberta Alberta in the lobby. This restaurant is actually part of a chain and apparently makes Napoli style food. I started off with a glass of red sangria 500 yen (about US$5). Kind of sweet, I think this would be great during summer. Satoshi had a beer 600 yen (about US$6). We ordered the mixed salad 750 yen (about US$7.50). This was good with roasted vegetables like kabocha (pumpkin), red/yellow pepper & eggplant. I thought the scoop of potato salad was unnecessary on top. Next, we had the pescatore with tomato sauce 1850 yen (about US$18.50). You could order it Napoli style, which was an oil sauce, but we chose the tomato sauce. We were surprised at how generous they were with the seafood, though I didn't appreciate crunching on sand in some places. At this point, Satoshi ordered a glass of white wine 400 yen (about US$4). Lastly, we had their pizza pazza (I hope this is how it is spelt) 1550 yen (about US$15.50). It was a Napoli style pizza--half margherita, half quatro fromage (4 cheese). We loved both, I especially liked the quatro fromage, it had lots of gorgonzola on it. The prices were reasonable, and the portions quite large by Japanese standards, our total bill was 5932 yen (about US$59.32). My only gripe was that they allow smoking, other than that, service was good and their food was delicious.